Click on a word, then scroll down to Latin to see the translation. Click on "Book I Dictionary" on the right. Click on the speaker icons to hear the word and an example. Includes recommended websites to interactive lessons, pronunciation guides, quizzes and exercises. Rules of grammar, pronunciation tips, vocabulary lists and puzzles encourage further practice. Humorous illustrations demonstrate hundreds of everyday phrases with tips on pronunciation and grammar. Ideal for complete beginners, it includes rules of grammar, pronunciation tips, vocabulary lists and puzzles to encourage further practice, plus links to recommended websites with video clips and activities. 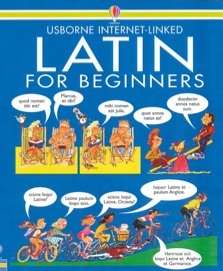 I have just started latin at my new school but all my friends have done it for a year before and this book has helped a lot I would recommend it! Latin is a hideously difficult language, and I do not believe that this book will take you far, but as a fun introduction to Latin it is unbeatable. Accept its limitations - and enjoy.